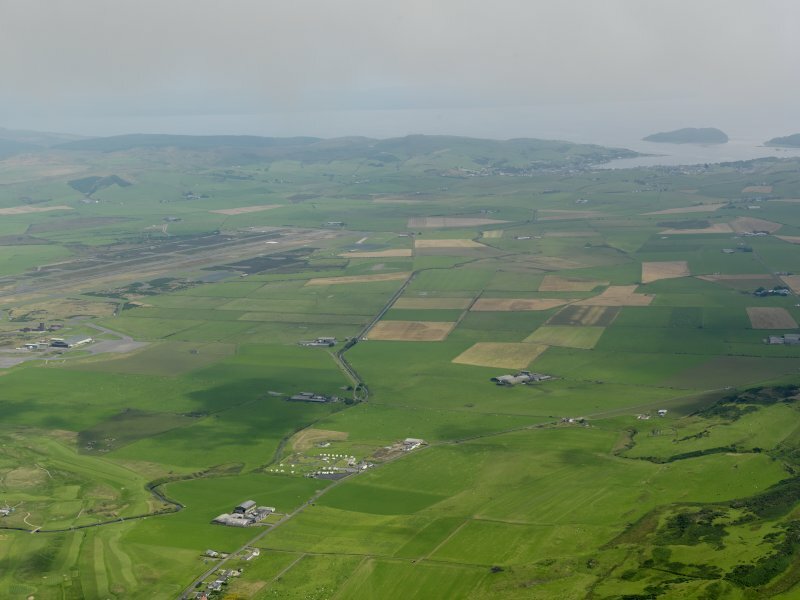 General oblique aerial view of Campbeltown Airport and Tangy Wind Farm, looking NW. 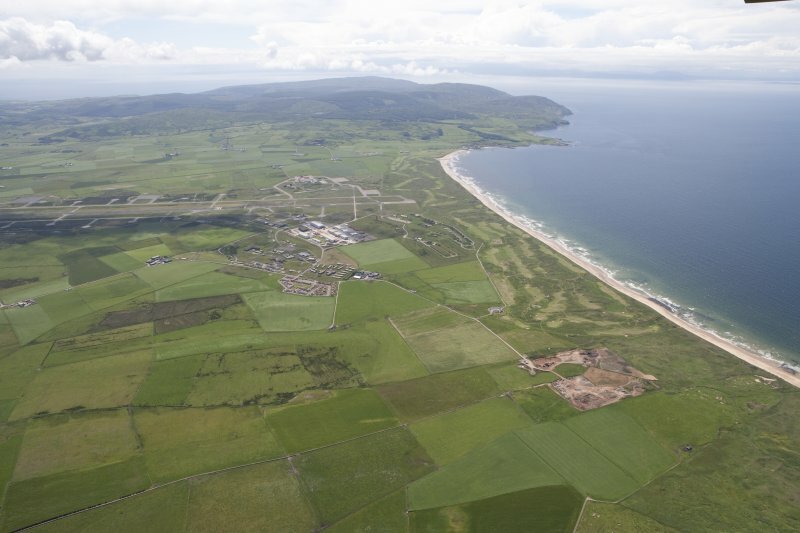 General oblique aerial view of Machrihanish Golf Course, Langa Quarry and Campbeltown Airport, looking SSW. 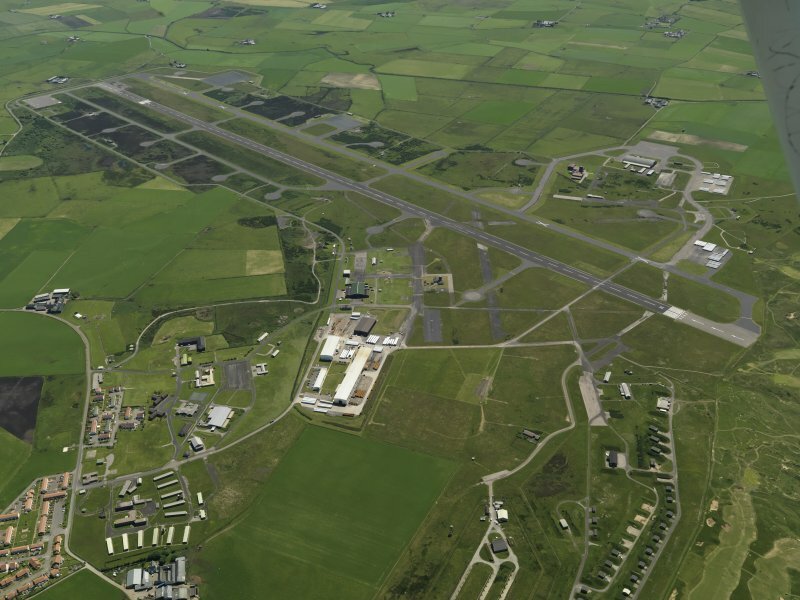 General oblique aerial view centred on the airfield, taken from the NNW. 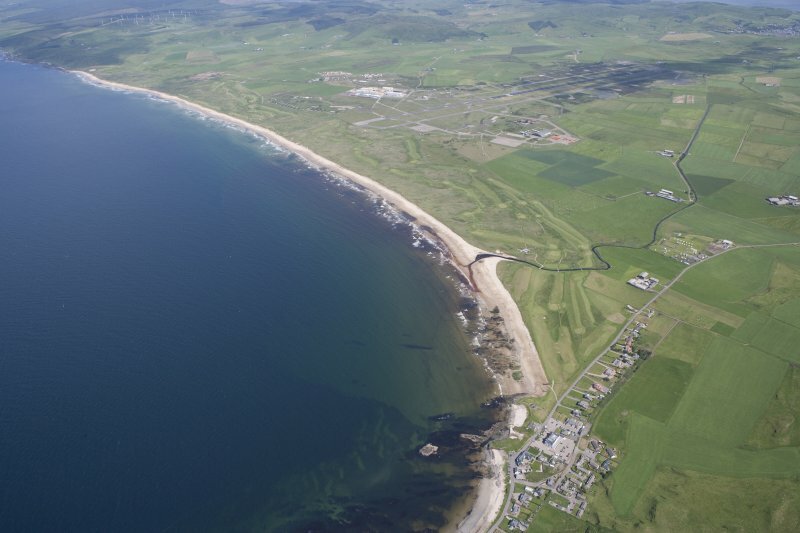 General oblique aerial view looking down the main runway at Machrihanish Airfield, taken from the E.
General oblique aerial view of Machrihanish Golf Course, Langa Quarry and Campbeltown Airport, looking SE. 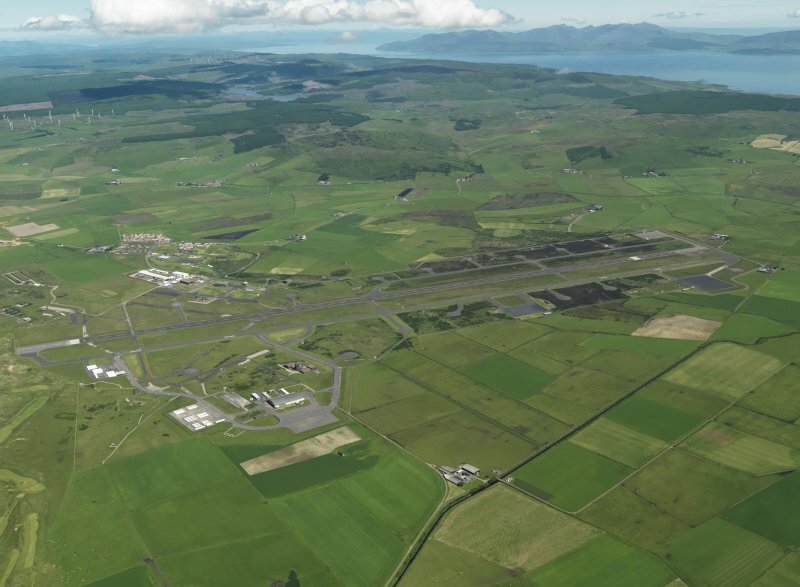 General oblique aerial view centred on the airfield, taken from the NW. 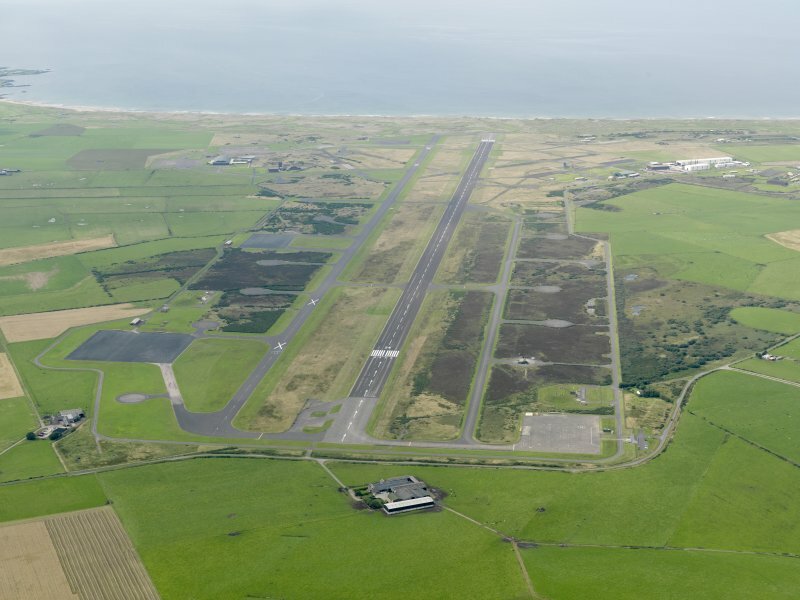 General oblique aerial view centred on the airfield, taken from the ESE. 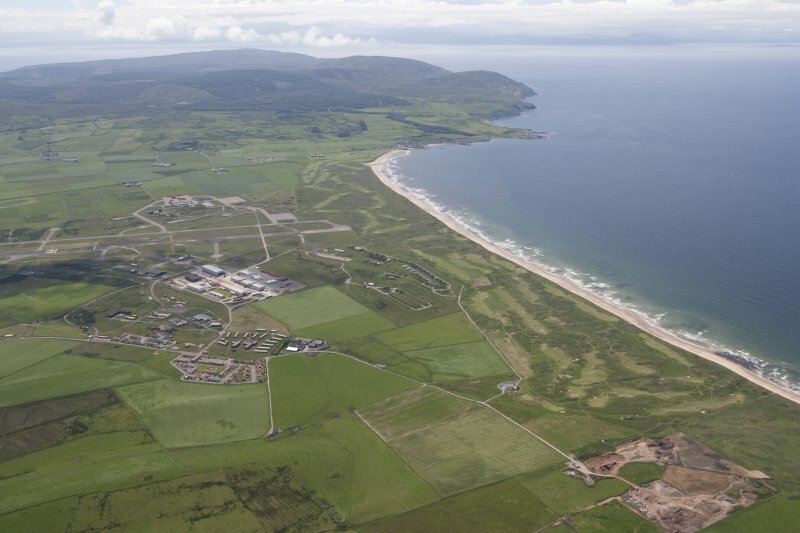 General oblique aerial view centred on the airfield, taken from the SW.
Oblique aerial view of the hangar at Machrihanish Airfield, taken from the SW.
Oblique aerial view of Machrihanish Golf Course, Campbeltown Airport and Langa Quarry, looking SW.
General oblique aerial view centred on the airfield, taken from the WNW. 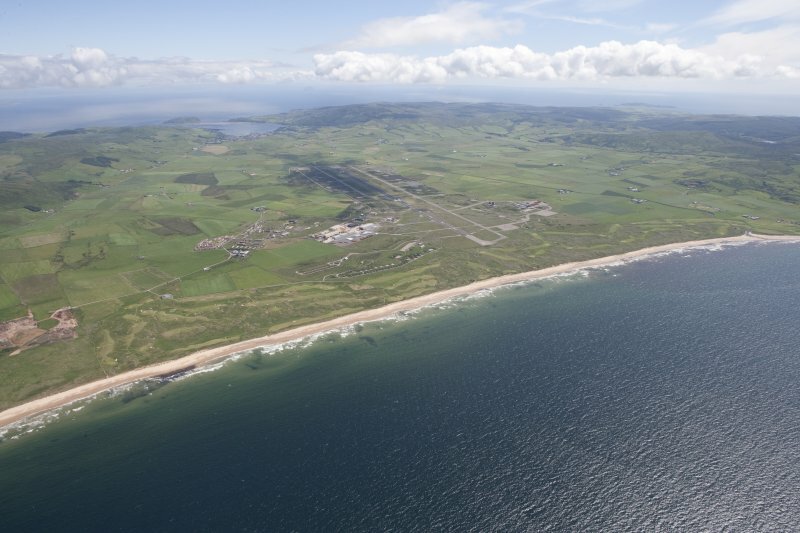 General oblique aerial view of Machrihanish Golf Course and Campbeltown Airport, looking NE. 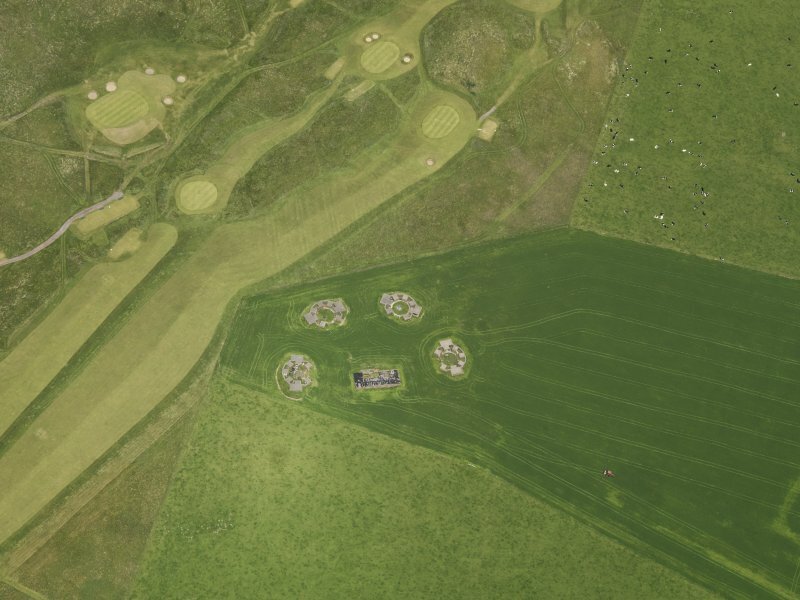 Oblique aerial view centred on the anti aircraft battery, taken from the SE. 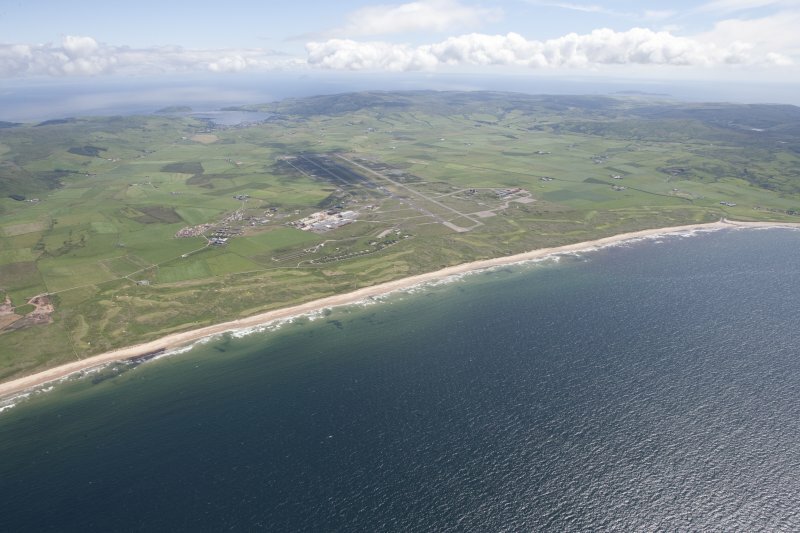 General oblique aerial view looking across Machrihanish Airfield towards the windfarm, taken from the SSE. 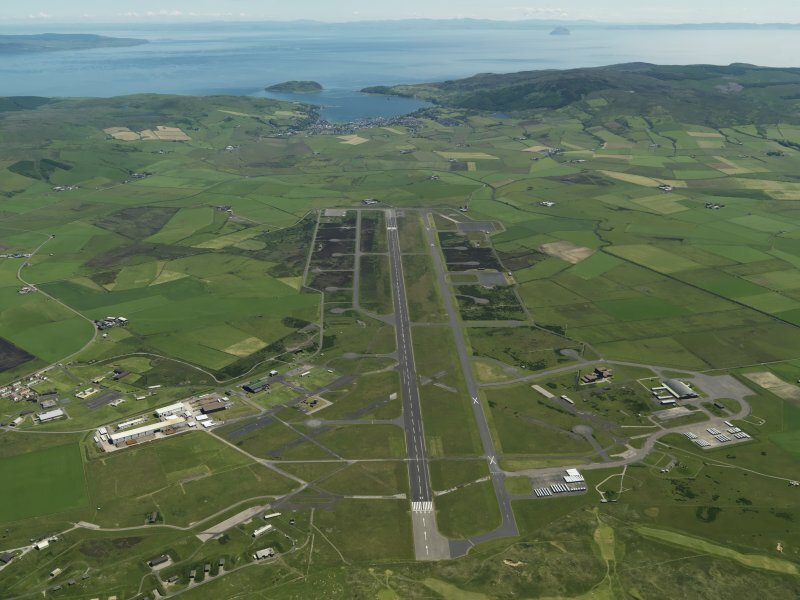 General oblique aerial view of Machrihanish Golf Course and Campbeltown Airport, looking SW.
View from WNW of main runway. 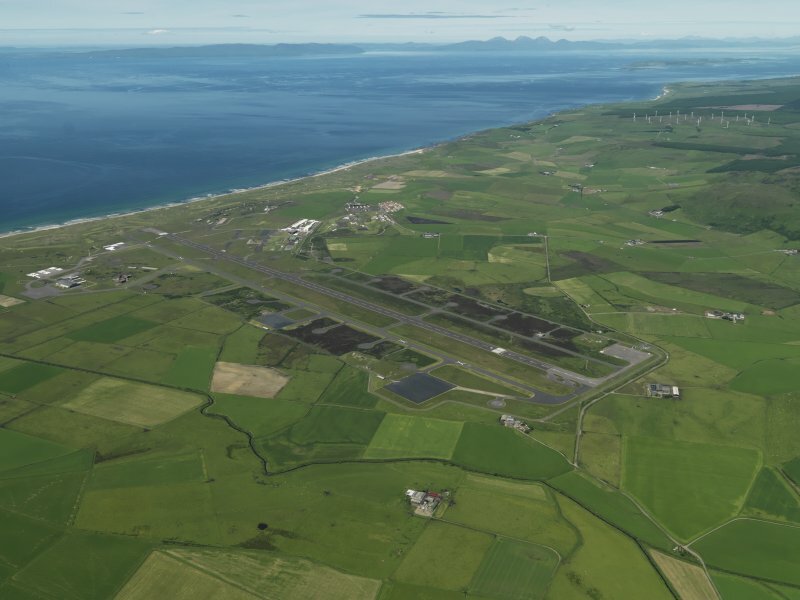 Oblique aerial view of Machrihanish Airfield looking along the runway, taken from the WNW. 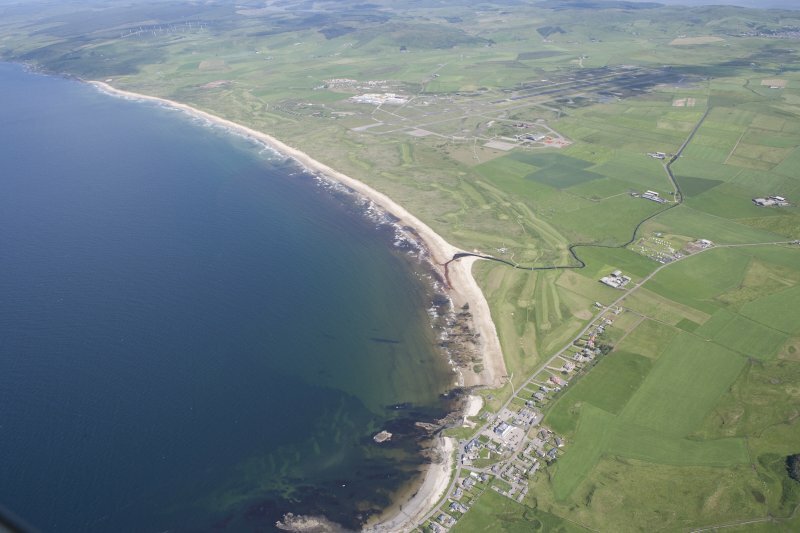 General oblique aerial view of Machrihanish Golf Course and Campbeltown Airport, looking SE. 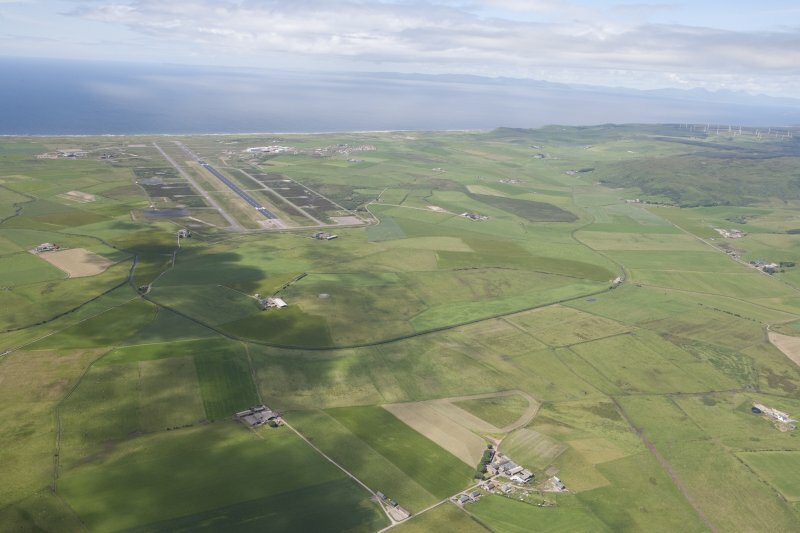 Oblique aerial view of Machrihanish Airfield, taken from the ENE. 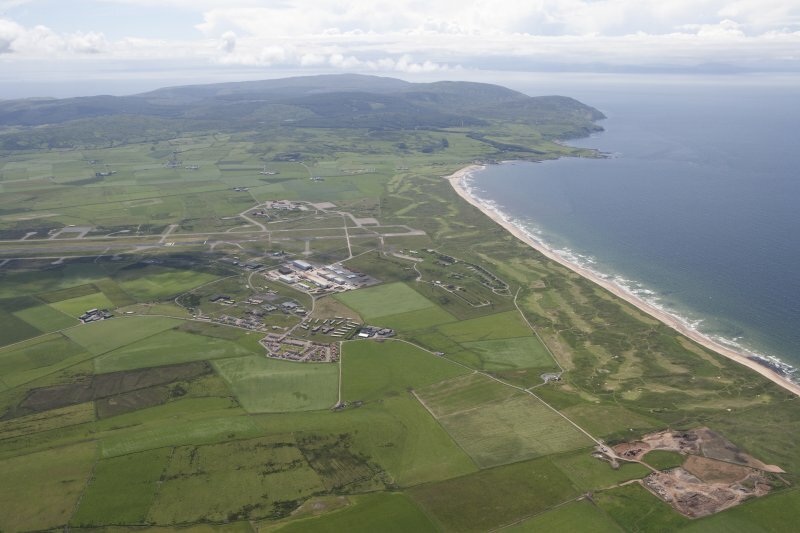 General oblique aerial view centred on the airfield, taken from the E.
General oblique aerial view looking towards Campeltown in the distance, taken from the W.
General oblique aerial view of Campbeltown airport, Machrihanish, taken from the WNW. 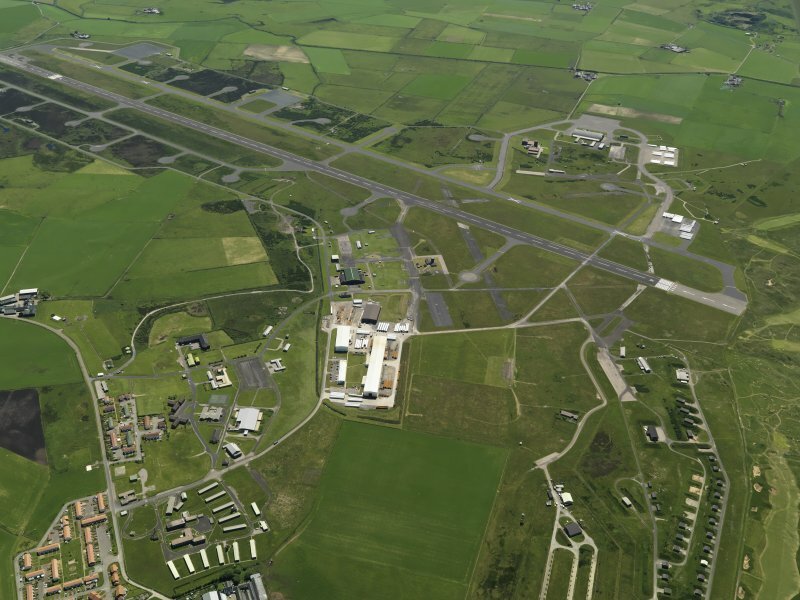 General oblique aerial view centred on the airfield, taken from the SE. 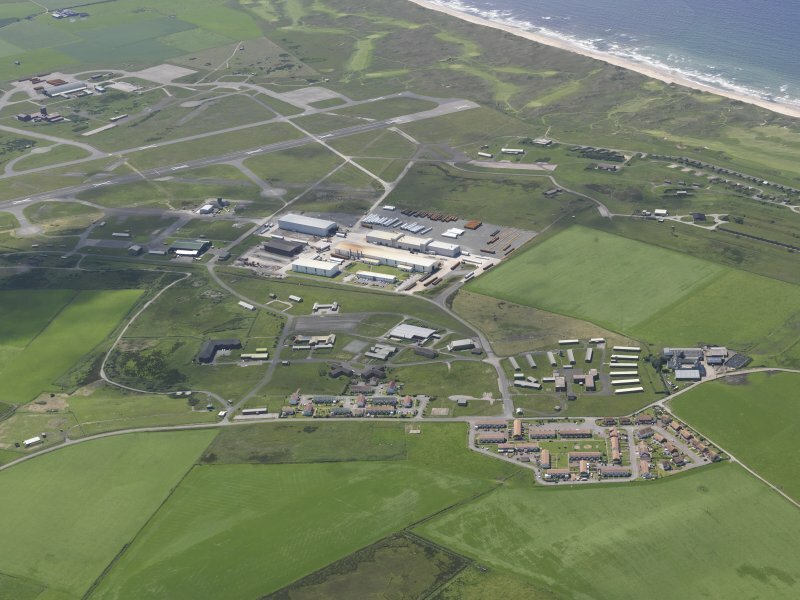 General oblique aerial view centred on the airfield, taken from the SSW. 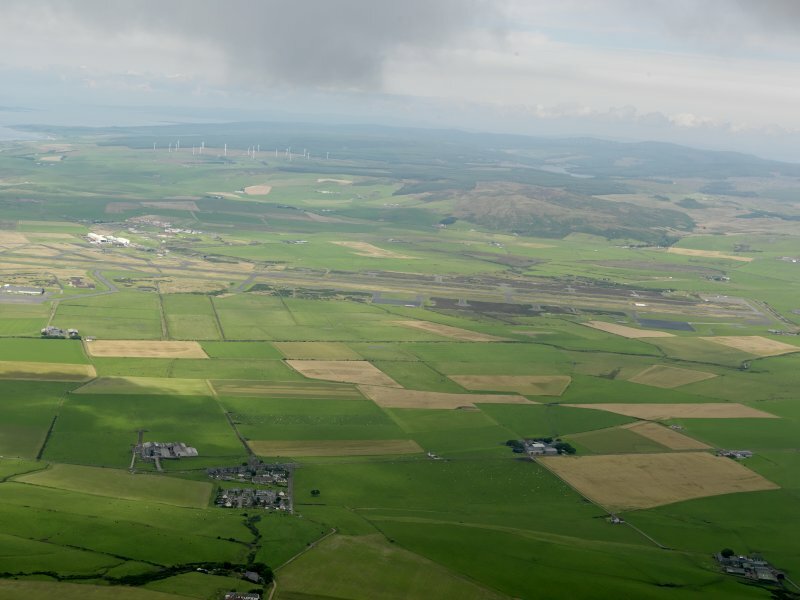 General oblique aerial view looking across Machrihanish Airfield towards the windfarm, taken from the SSW. 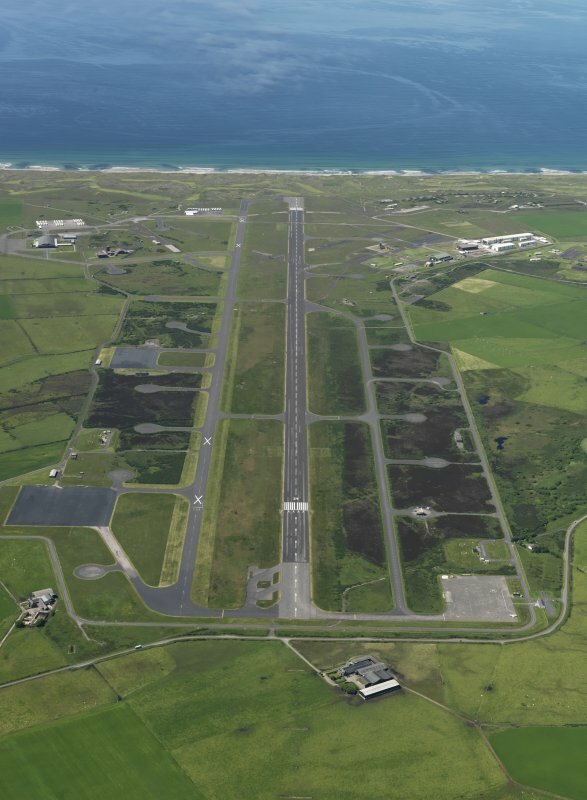 For (Parkfergus) logboat found on the S side of the airfield, see NR62SE 3. 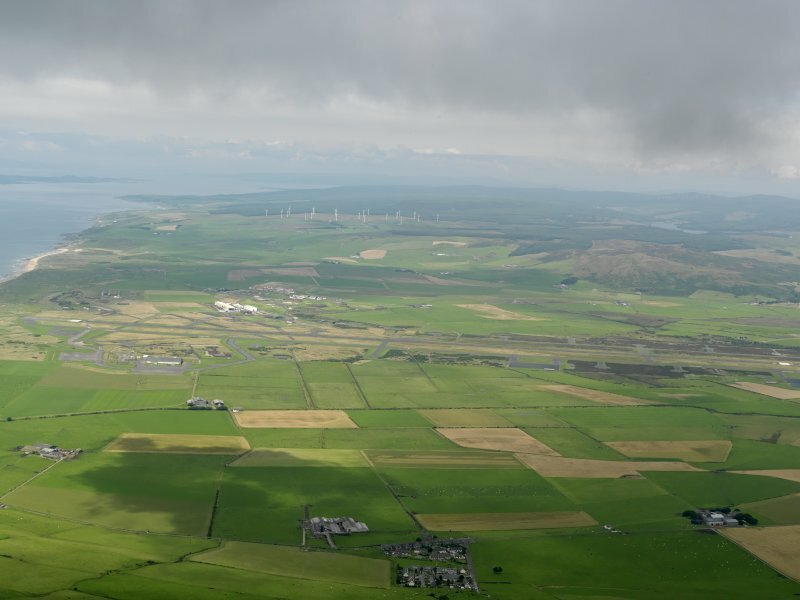 For wind farm construction yard (centred NR 66232 23016) within the area of the airfield, see NR62SE 35. 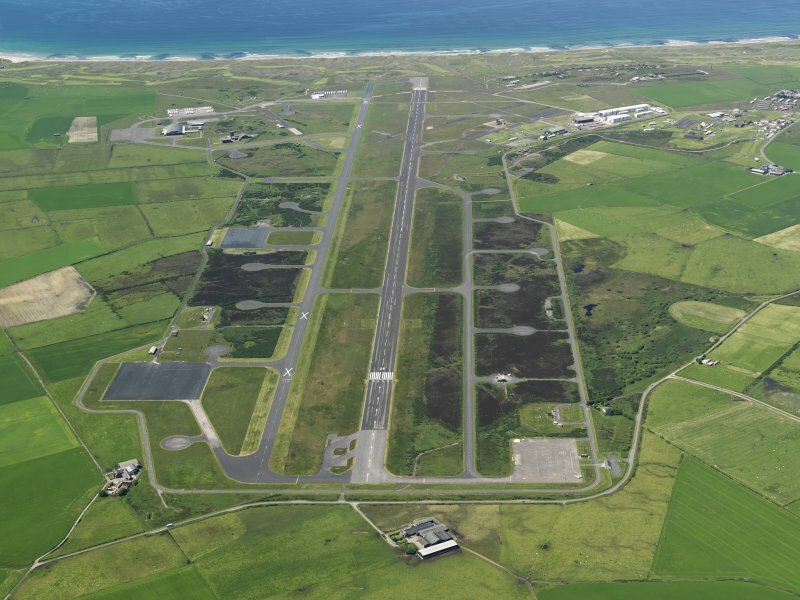 Unusual in that it had three separate periods of existence, it began life in August 1918 as a sub-station of the airship base at Luce Bay. Closing in late 1918, it was rebuilt at the beginning of the WWII, becoming HMS Landrail during 1941. 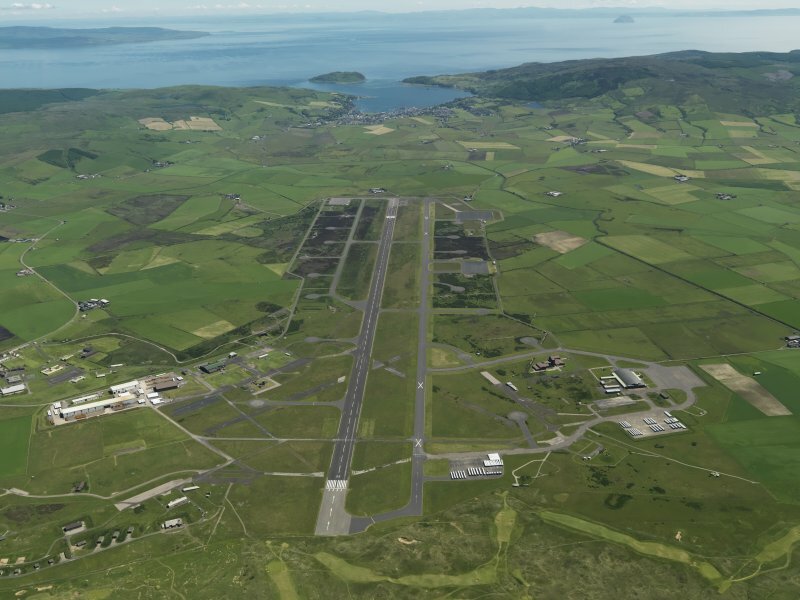 Early in 1945, it became disused but was maintained until December 1951 when it recommissioned for training. 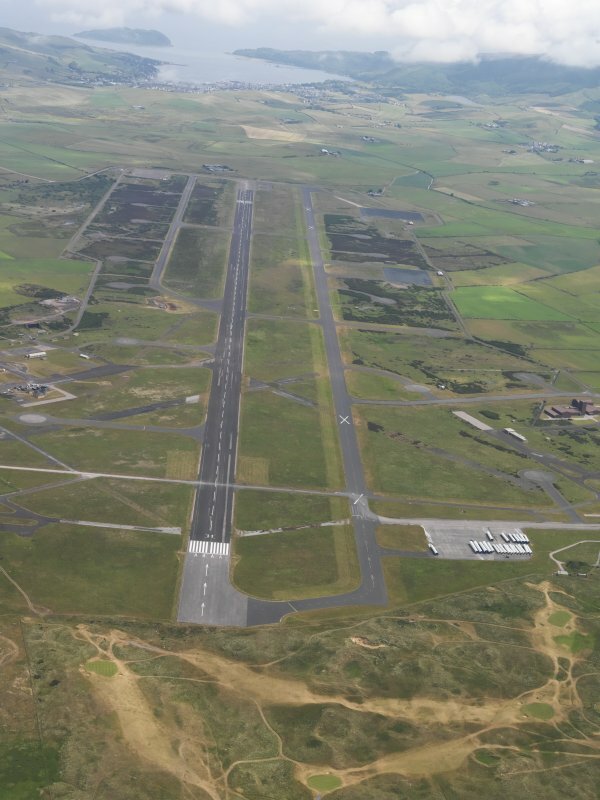 Abandoned a second time in 1953, the airfield underwent major reconstruction for NATO in 1960/62, also becoming a US Navy weapons facility and Master Diversion Airfield. 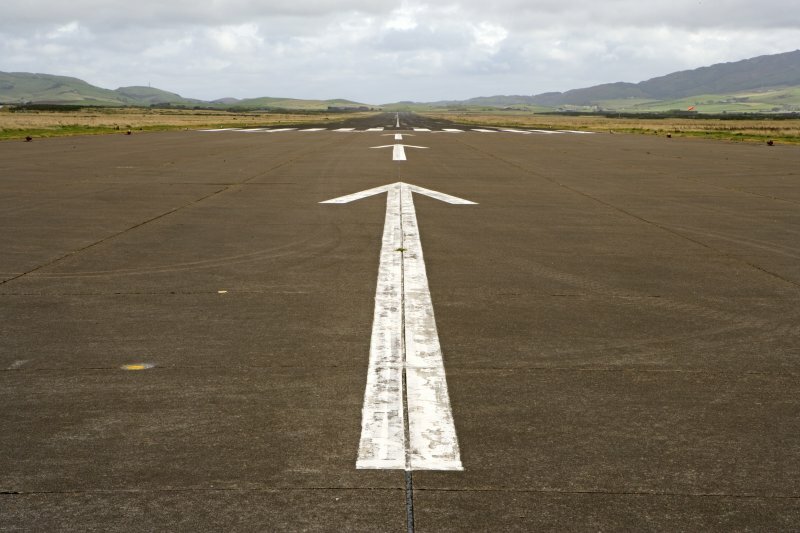 The four runways were replaced by a 10,000ft strip. 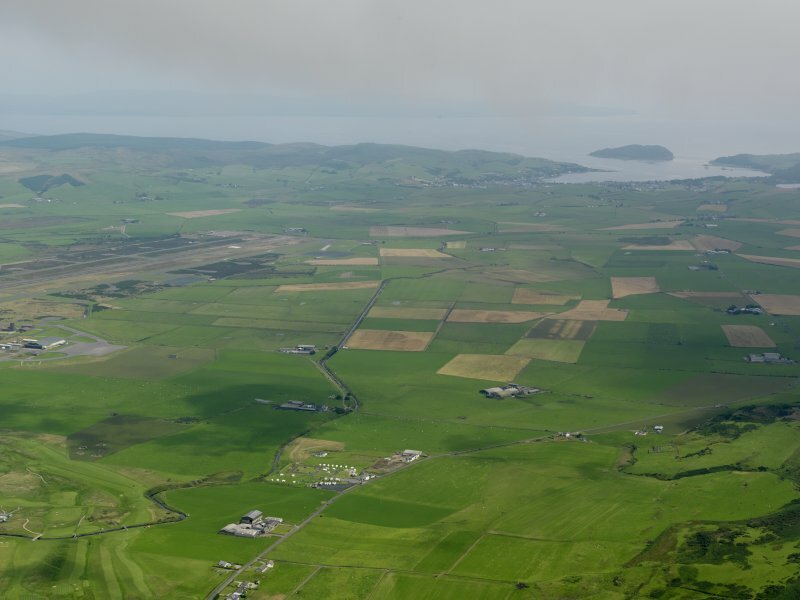 BEA/BA services were flown to Islay and Glasgow until taken over by Loganair in 1977. 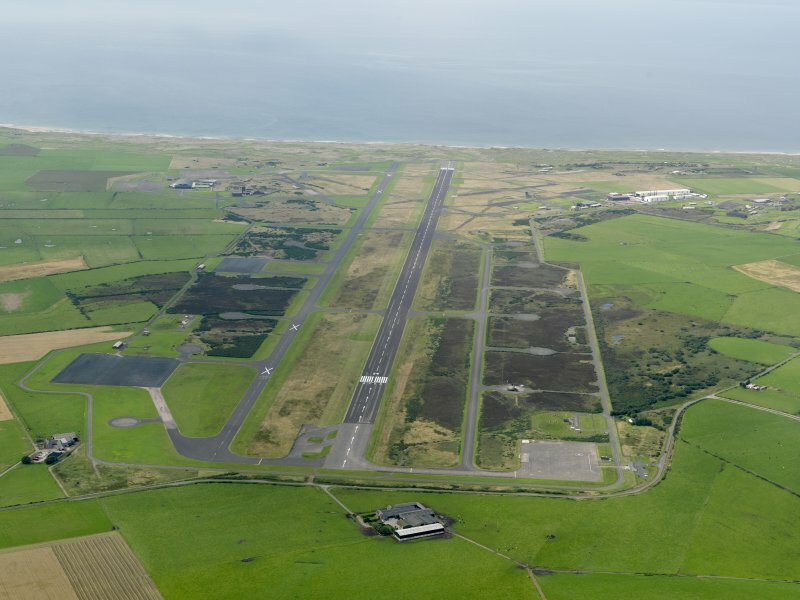 RAF Machrihanish airfield, now Campeltown Airfield is situated immediately E of the Links of Machrihanish and W of the main A 83 road from Campbeltown to Tarbert. 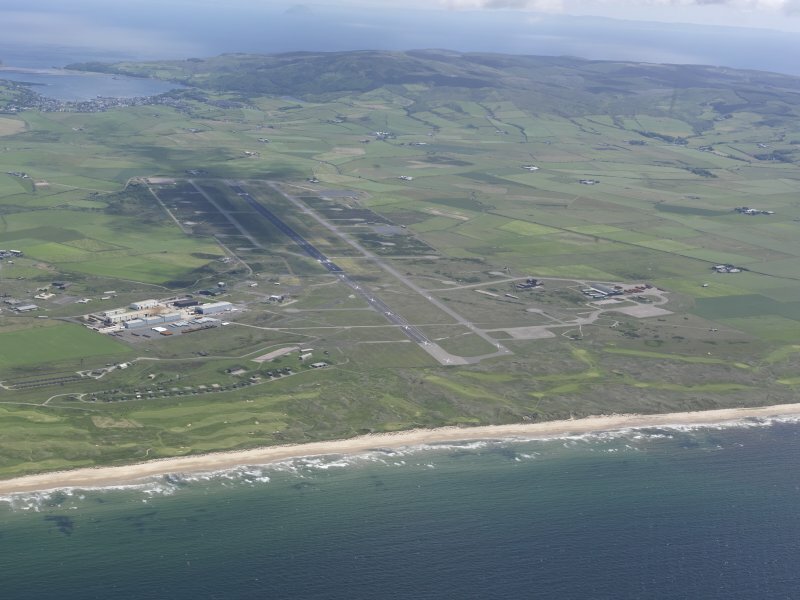 The site occupies an area of about 410.8 hectares with a main runway of about 3,079m. 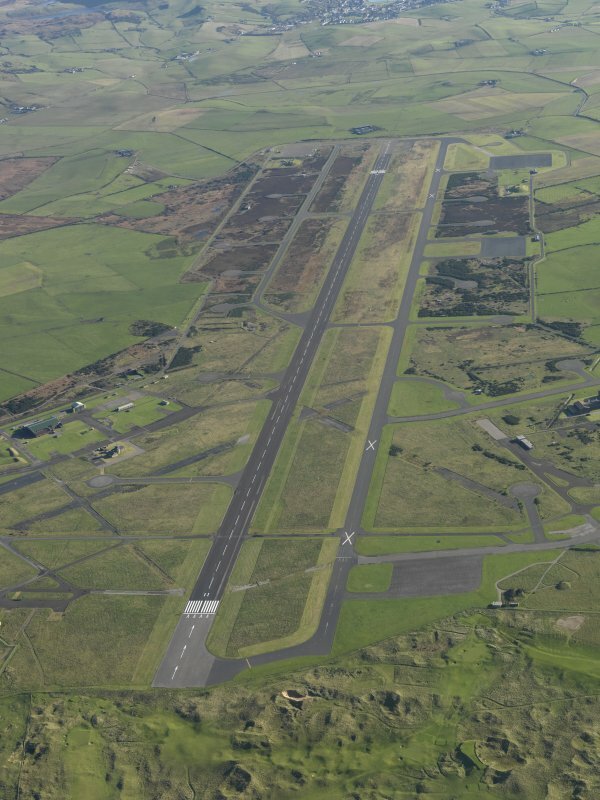 The military base is situated on the N side with the more recent civilian airport at the E end of the main runway. 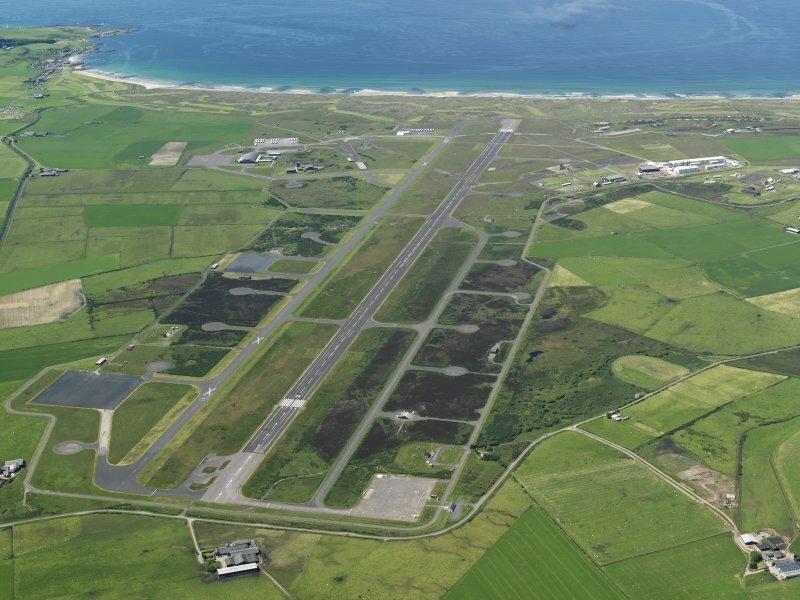 The airfield is now up for sale following the handing back to the Ministry of Defence (MoD) in 1995 by the United States Navy who had used the base as part of the NATO committment. 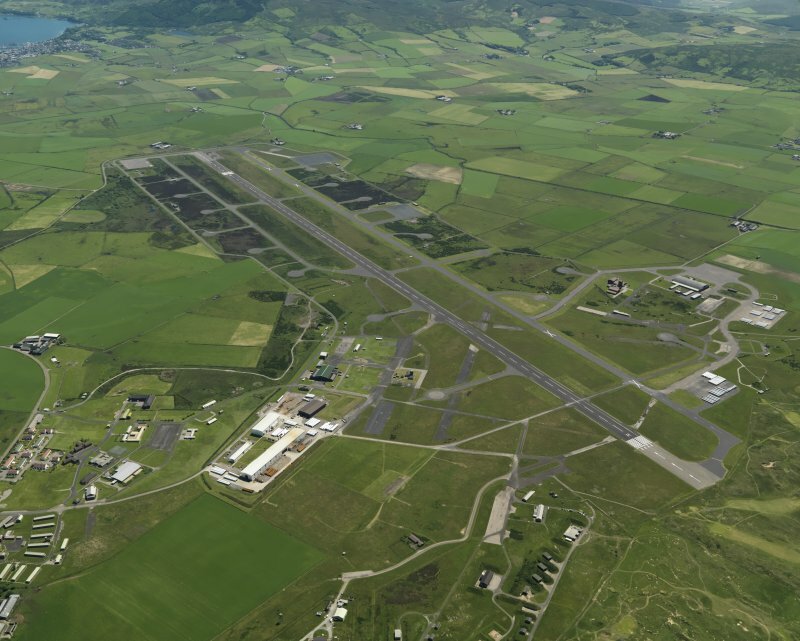 Most of buildings within the former base date from the post war period, most notably the decade following the major reconstruction and development between 1960-1970 to allow Vulcan bombers and other large aircraft to use the facilities. 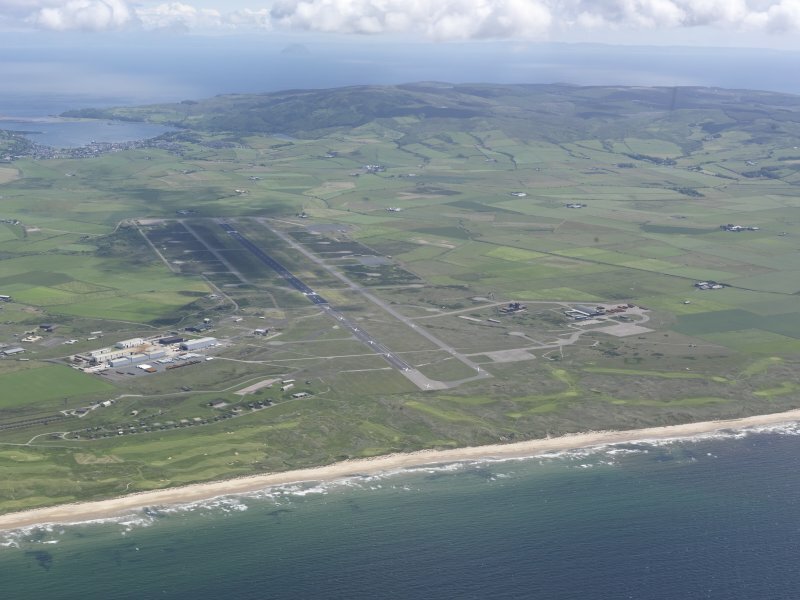 The US Navy established a weapons facility on the site, particularly for nuclear mines. 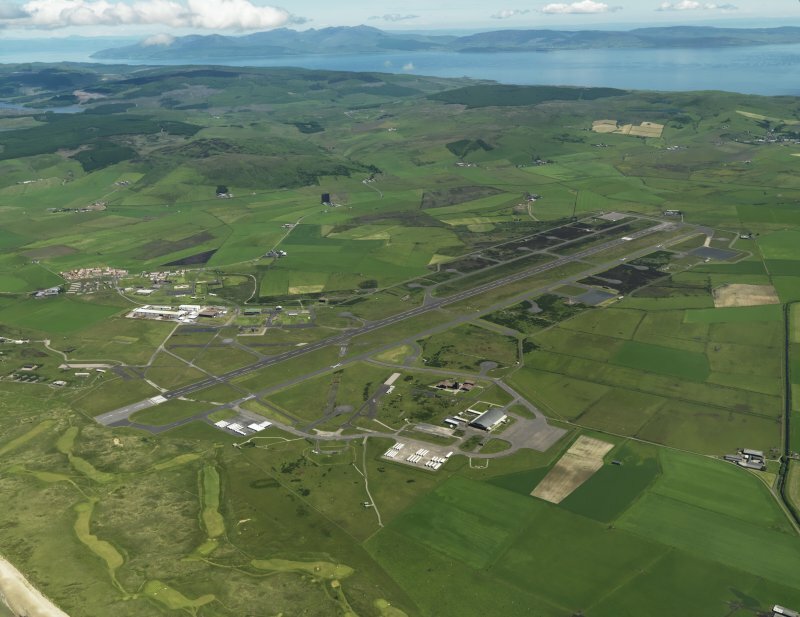 Accommodation and training facitlities were added, the resultant completed buildings being found at the SW and N ends of the airfield. 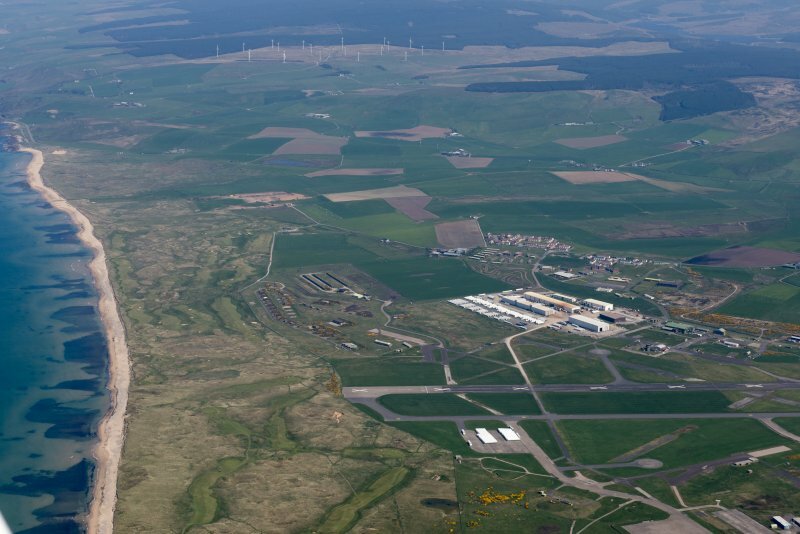 Several US special units were based at the site. 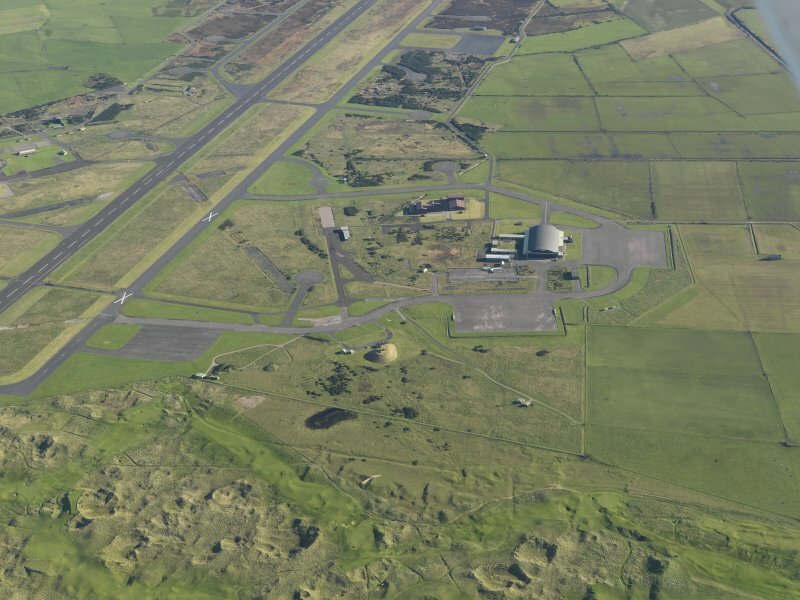 A Gaydon aircraft hangar and parachute drying tower with operations building were added to the SW area. 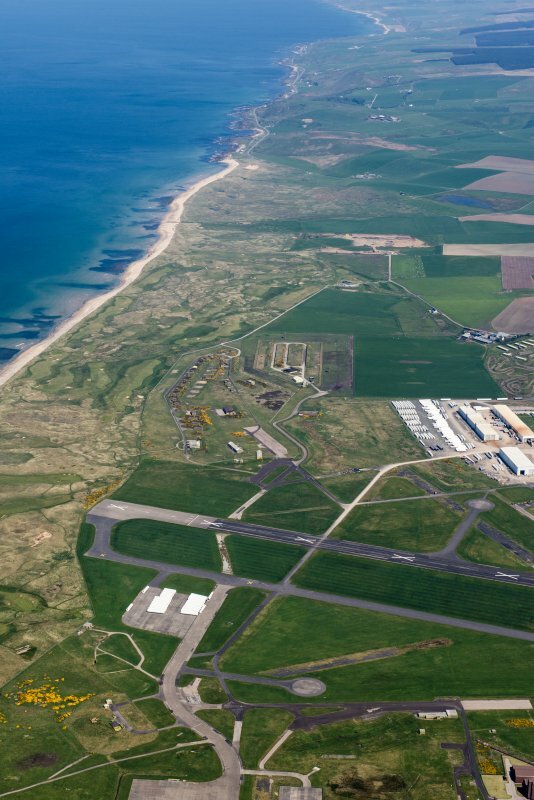 Following the handing back to the MoD the base was redesignated as MoD Machrihanish and was used by the Britiah Army for training purposes. 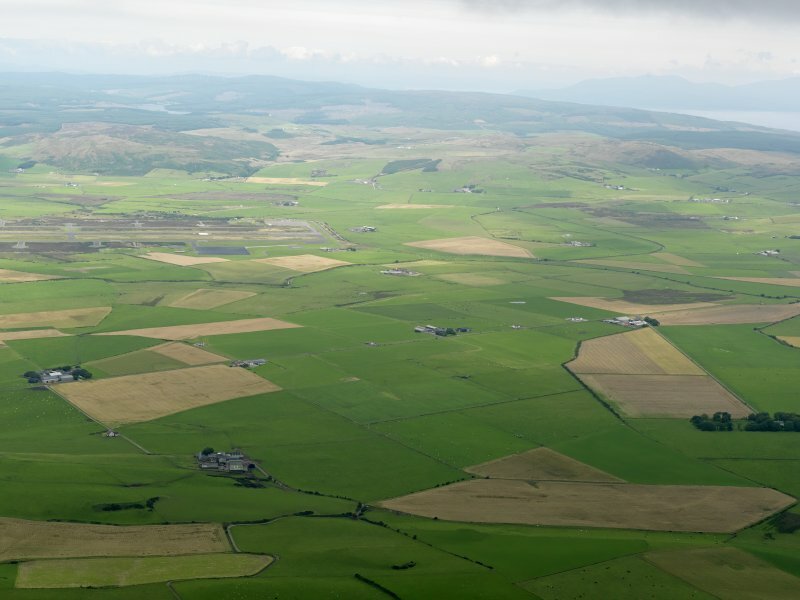 Little survives of the World War Two period, only one or two buildings were noted along with part of the old bomb store and information passed to RCAHMS by Defence Estates would suggest that many of the existing older structures date to the late 1940's and early 1950's rather than 1939-45 period, despite being of WW II design types. The gymnasium , squash court and several of the huts would fall into this category. 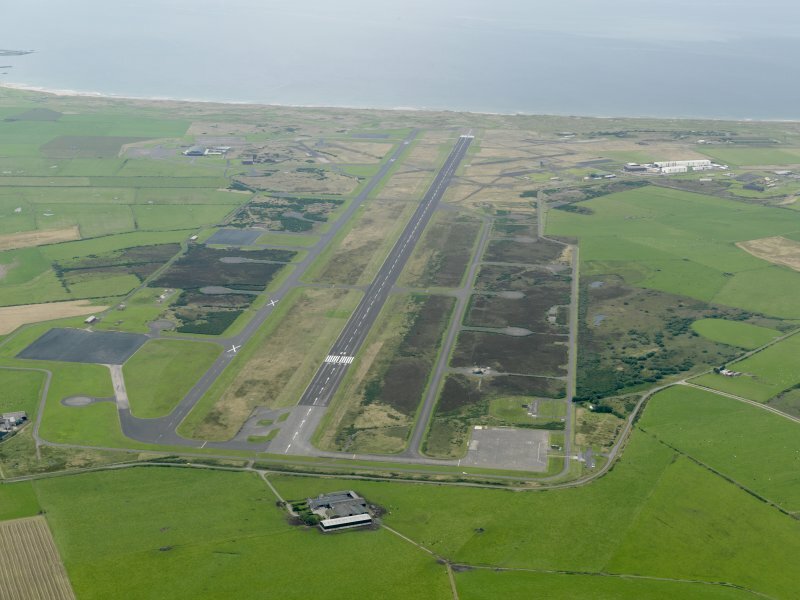 No wartime aircraft hangars survive on the site. Entry to the former military area is still restricted.